Big spenders today! I’m getting all generous with the food now that I know the week is coming to a close and I know what I need to keep for the next couple days. So yes, we can have rice AND beans! Breakfasts have probably been the easiest meal to get accustomed to on the SNAP budget. Oatmeal, smoothies, and eggs and pretty much what we would normally eat. We had to skip our Kashi high-protein cereal on our budget, but oatmeal is just as tasty, trust me. So day 5 started with our green monster smoothies with extra spinach today since there’s plenty left. Add two frozen bananas and soymilk and we have a $2.30 breakfast, including our tea. Having learned from earlier in the week, I knew that I needed to plan for snacks in the office, or suffer a terrible fate. So I got a little creative with my “leftover” groceries over the weekend. Based on my meal plan, I knew that I would have one egg, lots of rice and oatmeal, and some butternut squash left over. If you search those ingredients in any online search engine, you will come up empty. Trust me. I tried. So I relied on my experience. I was inspired by my mom’s simple rice pudding she used to make and every pumpkin recipe I’ve ever made. So the brown rice was cooked with plenty of water, some extra soymilk, brown sugar, cinnamon, nutmeg, and ginger. I blended a cup of butternut squash with the egg and some maple syrup and added to the rice with some oatmeal, salt, and baking soda. I baked it all until a knife came out clean and gingerly took a bite. Be prepared to eat all experiments, right? Well, we got lucky this time and it actually tasted good! 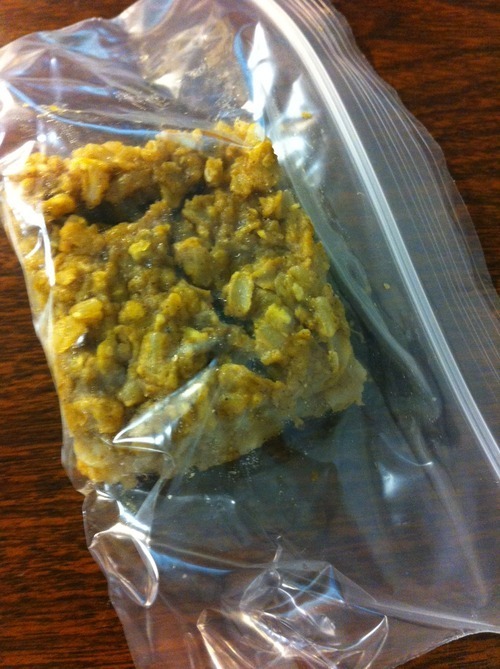 For $.19 per square, we have our very own snack bars! In honor of the challenge that bore them, I have dubbed them SNAP bars. So these helped get us through the day. 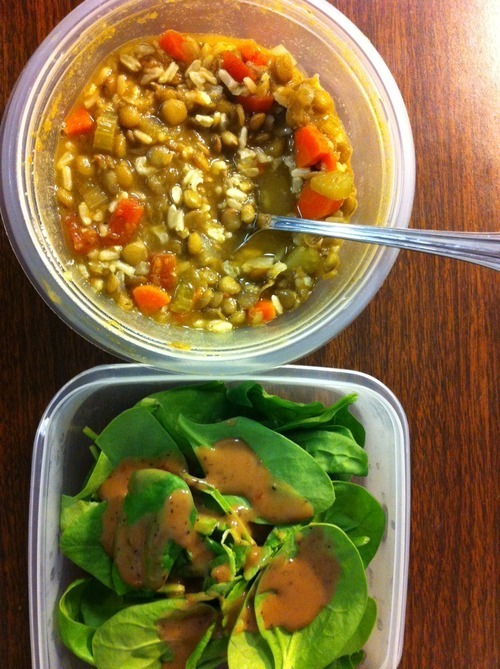 Lunch was leftover lentil soup with some extra rice thrown in and a simple spinach salad. And it turns out that I miscalculated the cost of the soup because it actually made 10 servings, not 8. So this lunch cost us $1.72. Snacks got us through the rest of the work day. An apple, two SNAP bars, carrots, celery, and hummus, and a yogurt for $2.41. But I was tempted to cheat again. My boss sat down to meet with me about a project and announced, “I brought snacks!” and I froze. She and I had talked about how I was doing with the challenge earlier in the day, and she figured my reaction out right away. Today, after the shame of my previous failure, I told her no. And in case she would feel bad for me, I added, “I’m not really hungry right now anyway.” And then I realized that what I said was actually true. I wasn’t hungry. My stomach wasn’t growling or hurting, so I didn’t need it. On any other day I would have accepted and enjoyed those snacks and consumed those calories out of camaraderie. Dinner was far more interesting than lunch. I wanted to make sure that during our week we had meals with different flavors and different kinds of cuisine. So tonight was Mexican night! Flip back down to the photo of all the groceries laid out on the table and you’ll see that there is no salsa, no cheese, no fresh tomatoes, no crisp lettuce. 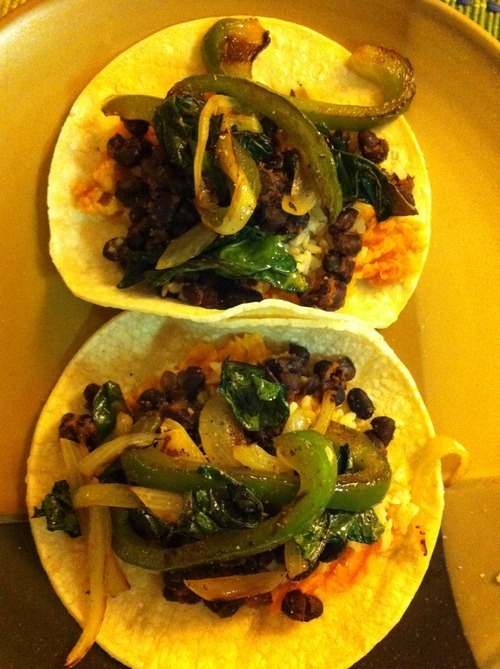 But we did have 10 small corn tortillas, black beans, rice, sweet potato, onion, a green pepper, and some kale (from the CSA). So after getting home from work, I started cooking the beans that had soaked overnight, chopped and sauteed the onion, green pepper, and kale, and microwaved and mashed the sweet potato. Ultimately they looked like this. Some spices and ketchup seasoned the beans a little bit, and hot sauce is a condiment and saved it the rest of the way. This Mexican feast cost $3.00 when we include the half a can of peaches that served as our dessert. Lessons of the day: The best reason to eat is to satisfy hunger. No other reason makes good sense.